The traditional time to pregnancy check beef females is later in the fall at weaning time. However, recent research by beef reproduction specialists shows pregnancy checking in the mid- to late-summer could be the preferred time to check females bred in the spring. The Missouri Show-Me-Select Heifer Development Program (SMS) requires heifers to be checked by a veterinarian before they're beyond 90 days into their pregnancy. More producers are now adopting this timeline even for heifers not in the SMS program and their cows. “The 90-day check for SMS is required because it enables most veterinarians to age the fetus or embryo more accurately. SMS heifer buyers like this as it aids in planning for calving management. Many veterinarians use ultrasound to increase their accuracy,” said Eldon Cole, a livestock specialist with University of Missouri Extension. Based on heifers sold in the November 2013 SMS sale at Joplin Regional Stockyards, 93.4 percent of the actual births occurred within two weeks of the estimated calving date. Cole says later pregnancy checking may only give you a “bred or open” call by your veterinarian or a first, second or third-trimester call. Herds that use early pregnancy testing are able to determine whether the female was bred by artificial insemination if at least 14 days elapsed between AI and cleanup bull exposure. Fetal sexing is possible by an increasing number of veterinarians who use ultrasound in the 60 to 80 day-bred females. The SMS protocol requires that leptospirosis vaccination be given at the early pregnancy check. were bred to the fixed-time artificial insemination 70-days earlier. The other four head were cleanup bull bred for 32 to 55 days. The downside of pregnancy-checking at this time of year is usually hot weather or field work related. Hot weather may be avoided by starting earlier in the day, if possible. If the producer has a covered corral that helps, but be sure there’s plenty of air movement and that the cattle are not crowded too tightly for extended time periods. 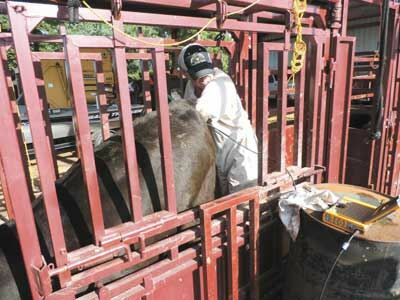 “Other reasons for working the herd now could be it forces you to run them through the chute and perform other health and management practices. Pinkeye seems to be affecting more herds this year in southwest Missouri. Working the herd gives you the opportunity to treat those in need. Perhaps you could sort the pinkeye victims off to reduce exposure of others in the herd and make it easier to retreat,” said Cole. Foot rot may be a problem that can be tended to at working time along with other issues. “If you have spring calving cows and their non-replacement calves have not been given a growth promoting implant this could be a chance to administer it. Flies may be increasing above the 200 flies per head threshold so spraying or pouring may be in order if fly prevention ear tags are playing out,” said Cole. Depending on the producer’s targeted calving season, Cole says this is a good time to pull your bull so he won’t be breeding his daughters. This move helps tighten the age range of your 2015-calf crop and improves uniformity for marketing.